Have you ever noticed that smiles are contagious? When you are in a group or even talking with someone else one-and-one and the other person is always smiling, chances are you will smile as well, even if you’ve had a bad day. This is because humans are social creatures, and we are programmed to respond to others’ nonverbal cues. Even the physical action of smiling can make us feel better. Smiling quite literally spreads happiness. By increasing social bonding, smiling can improve your longevity and help you lead a more healthy life. Confidence, higher self-esteem, healthy relationships, positive attitude: all relate to smiling. Of course, a key component of a great smile is great teeth. If your teeth are crooked, discolored, or missing, you may be self-conscious of your smile. You may cover your hand with your mouth when you smile, or avoid smiling altogether. As a result, your self-confidence, self-esteem, and positive attitude will suffer. It becomes more difficult to bond with others, to signal approval, agreement, or even just friendliness. Worse, society conspires to make us embarrassed at our smiles. From billboards to TV commercials to Instagram posts, we are bombarded by images of people with perfect smiles, often computer-manipulated to erase imperfections. Teenagers are particularly susceptible to the pressure to look perfect. Anything to get voted Best Smile in the yearbook, or get the most likes on their posts! Braces have been around for decades. But braces technology has seen drastic improvements over the years. Now, different styles, patterns, and even colors of braces have become available. Orthodontics not only builds the confidence and self-esteem of teens, but sets them up for a lifetime of improved oral health, since straight teeth are easier to brush, floss, and get professionally cleaned at the dentist. For image-conscious teens, Invisalign is a great orthodontic solution that straightens teeth while remaining invisible. 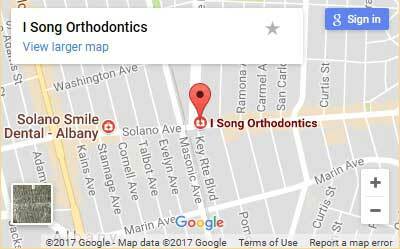 I Song Orthodontics caters to the needs of teens in Albany, Berkeley, and across the Bay Area. Creating better smiles for teens helps them come out of their shells. They’re able to participate in the average hang-out and conversations with more self-confidence than before, helping them make friends and cultivate the relationships they want. At an age when the group’s approval is all that matters, a simple smile can change a teen’s life. Remember, smiling is contagious!